If you are completely new to yoga, or have just started and are feeling completely overwhelmed with how to begin, why to begin, and what to do to begin, this Yoga for Beginners guide is a great place to start. My goal for this article is to show those of you that are new to yoga all the basics you need when starting and ease you through the confusion and plethora of information out there to develop a fulfilling and successful practice that truly transforms you, because that’s what yoga does! I started yoga in 2015 when my boyfriend (now fiance) told me about his positive experience with it in college. I had originally started it because I was in nursing school at the time and extremely stressed out (I’m a super type A personality! ), and had also been dealing with a lot of aches and pains from my new nursing assistant job I had at the time. But yoga did so much more for me than I thought it would. Not only did it decrease my stress levels and help heal my aches and pains, it completely transformed my body and the way I perceived the world and my experiences. That might sound a little dramatic, but it’s true. I was an extremely negative person before I started yoga, and I must say the change I experienced mentally is what I value the most. Yoga absolutely has multiple positive effects on you physically, but it also affects you mentally, emotionally, and spiritually as well. Yoga can also help you become more in touch with yourself and increase self confidence. It is often called “meditation in motion” as yoga promotes you to be completely present in the current moment. It is also a very effective method to implement into your life to lose weight. Depending on the type of yoga you are doing (which I will be going into later in this article), yoga is an extremely effective cardio workout. It has been said that a “flow” style yoga class such as Vinyasa yoga can burn up to 594 calories in just one hour. This goes to show you don’t need to spend hours on a boring elliptical or run for hours a day to lose weight. And the truth is, when you do the same repetitive movements like you do on an elliptical or treadmill, they aren’t as effective. Your body becomes accustomed to the stress and you eventually plateau. I think one of the most confusing and overwhelming things for beginners are the numerous different varieties of yoga. It can make deciding which one is right for you very hard and sometimes lead to delaying starting your practice all together all because you simply can’t figure out what KIND of yoga you should do. Hatha simply refers to the practice of physical postures, which makes this a very general term, and can make one confused on what to expect when trying out this style of yoga. When a class refers to itself as a “Hatha” yoga class, it usually means it will be more beginner friendly and move at a slower pace. You most likely won’t get a great cardio workout from this type of class, but it is an excellent place to start to learn the postures at a steady pace, and your body and mind will most definitely feel more relaxed afterwords. This is the type of yoga I started out with when I started going to classes, and I’m glad I did. The teachers go much more into depth on how to do each pose because they know the majority of people in the class are new. They also go more into detail on the benefits of each pose which is nice when you’re starting out because you tend to be unsure of how a certain pose is supposed to feel. Best for: Beginners who want a slow, steady paced class and learn the basics of each pose. Iyengar focuses on correct alignment and posture during each pose. It is a slow moving class where you stay in the same pose for a few minutes, and the use of props are encouraged to properly execute each posture. I highly recommend taking an Iyengar class when first starting out. I waited a year until I finally went to one, and it helped me out so much! I hadn’t realized how wrong I had been doing some of the poses. The teacher will go over how you should feel, proper placement of each body part, and how to properly use props like blocks to reach the best version of the pose as possible. This is a great class to develop a strong base and learning how to do each pose the right way. Best for: Learning proper alignment and posture during each pose, as well as developing flexibility with the use of props. This is definitely the type of yoga you should try if you are looking for a workout, but only after you have gotten down the basics for awhile. I would definitely not recommend this type of class for beginners just because you need to know a memorize a sequence of postures. Ashtanga yoga consists of sequences of the same postures, done in the same order every single time. Every posture is done in conjunction with your breath, so is great for promoting mindfulness and getting into the “flow” state. While it s a great workout, it is not the best for developing an understanding of all the different types of postures, and can become boring for those that like more of a variety. Best for: A great workout and for those that are looking for consistency; more suitable for people with more experience in their practice. Vinyasa is very similar to Ashtanga yoga, except every single class is different, which in my opinion, I prefer! Postures are also linked with the breath, and the movements are made to be very fluid like in transition to each other while also making you work up a sweat. In my opinion, you get the best of both worlds with Vinyasa yoga: a great workout that burns fat and builds strength, while also promoting mindfulness and increasing range of motion with it’s variety of poses. I have been practicing Vinyasa yoga for over a year now, and truly enjoy it the best out of every style I have tried. It is beginner friendly, but I would recommend going to a Hatha or Iyengar style class first to really ground in the basics, as the teachers at these types of classes don’t usually help with alignment because of its fast paced nature. Best for: Beginners looking for a dynamic class that changes every time, and who are looking to get a workout while increasing breath awareness. If you are looking to completely sweat out all your toxins or simply just love the heat, Bikram yoga is a definite candidate for you to try. It is a type of yoga that consists of the same 26 poses, that are done in a heated room to 105 degrees Fahrenheit. Due to its lack of variety of poses as similar to Ashtanga yoga, you may not want to do this class if you get bored easily and are looking for a more dynamic class. Best for: People who love the heat and are looking for a sweat drenching workout that is the same each time like Ashtanga. Hot yoga is another general type of yoga that includes other types of yoga within it. It just refers to the conditions you are doing yoga in, which are the same to Bikram yoga, a room heated to 105 degrees Fahrenheit. The only difference is that the styles of yoga can change, so do not stick to the same 26 poses each time. The Vinyasa yoga I have been practicing for over a year now is actually a Hot Vinyasa yoga, meaning it is vinyasa style yoga in a heated room. A major benefit of hot yoga is that it really improves your flexibility during the class and allows you to get deeper into each pose. I will most likely say this again, but if you do decide to try a hot yoga class, make sure you bring a water bottle! Depending on who you are, you will sweat SO much and lose a lot of fluids. I will go more into what to bring to your first yoga class later in this article. Best for: People who love the heat but are also looking a variety in the poses they do and like doing something different every time. If you are looking into starting yoga for emotional, spiritual, and mental health reasons, this is a great practice to try. Kundalini is a Sanskrit term that refers to energy and consciousness which is located at the base of the spine, at your first chakra. This class involves a lot of chanting, singing, and different styles of breathing in pair with physical movement. I have only been to a Kundalini Yoga class once, and although I did enjoy it, it was just not physically involved enough for me. I rarely broke a sweat and did not feel like I had really released that much tension from my physical body, which is one of my favorite things in a yoga class. I did feel mentally clear and my mood felt lighter afterwards though, so I would highly recommend it for those purposes. Best for: Those looking to become mentally stimulated and spiritually awakened while incorporating chanting and breathing with physical movement. This is a slow paced and calm practice that focuses on balancing the “yin” and “yang” energies, which refers to the feminine and masculine energy inside of everyone. This type of yoga focuses on releasing tension in deep tissue and holds poses much longer than other practices. You can be in a pose for as long as five minutes, but for beginners they say to start at two minutes. You will feel restored and peaceful after this type of class, and will improve your flexibility while do it. Best for: People looking for a calm yoga practice to wind down and to flexibility. Another slow paced class similar to Yin Yoga, but this one focuses more on healing current aches and pains and restoring you back to life. This class uses a lot of different props like bolsters, blocks, straps, and blankets to assist you in poses without stressing yourself in order to obtain the full benefit. I was going to a Restorative Yoga class for almost a year when I was dealing with a lot of pain related to working long hours at the hospital. Not only did I completely recover from my ailments, but my teacher taught me so much about the human body throughout the process. Restorative yoga classes are changing and the teacher uses different methods to aide the students in different stretches. For example, one class I went to the first 20 minutes were spent in a chair doing unique movements that stretched and opened different areas of the body. Although you don’t generally work up a sweat in this type of class, you will build strength. Similar to yin yoga, you hold some poses for longer periods of time, which may include poses that engage your core, like boat pose. It doesn’t last long though, and is specifically to help your body build strength so it can repair itself. Best for: People who are trying to heal their aches and pains naturally, or looking for an overall calmer class that focuses on strength and stretching. One tip I can give you is if you are physically going to a yoga class (as opposed to finding one online to do at home) make sure you look at the schedule and see that it says beginner or level 1. If it doesn’t specify, it usually means that it is a class friendly to all level types, but you might want to call and make sure. One time I made the mistake of going to an intermediate class when I first started, and boy did I regret it afterwards. It was so hard for me to follow along because I wasn’t familiar with the different poses, and I wasn’t ready for the more advanced poses they were doing. The thing with classes that are designed for more advanced levels is that they don’t usually give you an alternative to the pose or assist with alignment because you are supposed to be well, more advanced. I ended up straining myself after that class and never did it again until I was ready, so make sure you listen to your body and move at your own pace! Below is a video from Yoga With Adriene on her YouTube Channel that is specifically designed for beginners. She is a super down to earth individual and following her is a great way to start your practice and become comfortable of your mat! 1.Do NOT compare your practice to others. This is one of the worst things you can do, and yet so many of us are guilty of it! You see someone who has been practicing yoga for years and is much more advanced than you, and it makes the negative thoughts start rolling in. Use your mat as your space and bring your complete attention only to that space during the time you are practicing. Allow yourself to let go of the negative thoughts and insecurities, and focus on yourself. You deserve it! 2. Do NOT overextend yourself out of ego. Pushing yourself in yoga is good, and in fact is essential to the growth of your practice. But pushing yourself in a pose to the max when you do not have a solid base just to prove something is NOT the way to do it. Trying out a complicated pose without first learning the basics can cause you to hurt yourself and is in no way helping you grow. This ties in with the first point to let go of your comparison to others, and focus on you and YOUR practice. 3. DO go at your own pace. Sometimes the pace of the class can become a little too much for you, and when it does, take a rest! You don’t have to keep up every second of the class. You can simply take a child’s pose and catch your breath. Make sure to listen to your body, and don’t push yourself too much to the point you never want to go back. Go little by little and develop your practice at your own pace. 4. Do NOT bad talk yourself. I did this a LOT when I first started yoga, whether I was in a class or at home alone. Starting something new is hard, so don’t be so hard on yourself! You should feel proud for finding it in yourself to get up and get on your mat, because that is the hardest part! One thing that I found that helped me eliminate the negative talk was to say a positive affirmation to myself before starting my practice. Replacing a negative sentence with a positive one will empower your practice and help you let go of your negative thoughts. Affirmations are just positive sentences that relate to goals you want to achieve. Including affirmations in your practice reprograms your subconscious mind to think more positively, and can actually help you achieve your goals faster. This is the affirmation I used when I was struggling to get down chaturanga. My upper body strength was pretty much nonexistent, and I felt extremely discouraged when I saw all the all people in my class easily do it. When I replaced this negative sentence with a positive one, it gave me a sense of achievement and pushed me to try harder. Within a few weeks I had gotten down the pose! You will learn so many new things in yoga (and I don’t mean just physically), and keeping an open mind is essential. One of the most amazing benefits yoga has is the ability to open your mind and make you think more positively. You may have not heard concepts that are now being presented to you. Open your mind and try them! For example, when I went to one of my first classes, I explained to my teacher I had lower back pain, and her response was that we were going to work on the core during that class. I remember feeling extremely frustrated and thinking “I can’t do any of this stuff with my back!” But little did I know having a strong core is essential to maintaining a strong back. I was completely capable of doing all of the poses, the only thing holding me back was my mind. You will feel discomfort when beginning yoga, especially if you were not blessed with a naturally flexible nature. One of my teachers would always tell us to “breathe through it” and “embrace the discomfort”. “You can do anything for a few breaths” she would say. Yoga teaches you not to identify with the discomfort, but to take notice of it and still be able to stay centered with your breath. This is essential to growing your practice, and I feel like a lot of people rush past this step. This refers to mastering the beginner basic poses before moving on to alterations and the more advanced poses. Some of the poses such as Mountain Pose may seem “easy” and “basic” but the truth is a lot of people do not do them correctly, and this in turn hinders their practice. You need to feel strong and grounded in each of your poses. When you rush through them, you create bad alignment, and will not obtain the full benefits of the pose. Be patient with yourself and take the time to fully learn the basics, and you will be on the path to an extremely successful practice. 1. Go to a free class. There a so many different forms of yoga, and it is important that you find out which one is right for you. I practice Hot Vinyasa Yoga, because I love the feeling the heat gives me when I’m stretching and it also aides in flexibility. There are benefits to each different form of yoga, but hot yoga definitely is not for everyone. A lot of studios have specials where they give you your first class for free or have deals where they offer a few classes for a low price for newcomers. Another good thing about going to a free class is you get to sample the feeling of the studio and the types of classes they offer. It took me going to a few studios to finally find one I felt comfortable in. Class size, yoga classes offered, schedule, and price are all pretty big factors in picking a studio. You don’t want to spend your money every month on a place you do not totally look forward to going to. So if you don’t like the first one you try out, just try another one! 2. Look up yoga classes online. If you are not comfortable going to a studio, or it is not in your budget, you can start your practice at home! There are TONS of classes online that offer a very large variety of styles of yoga. If you are practicing at home, I do suggest you practice in front of a mirror when first starting out so you can see that your alignment and posture are correct. 3. Start with a basic routine. This is what I did when I wasn’t comfortable with going to a studio yet. There are sacred routines known as sun salutations that are made up of a number of poses that you repeat in cycles. I started with Surya Namaskar A, and would do this every morning. It is a great way to become familiar with the poses and master the basics before moving on to more advanced sequences! 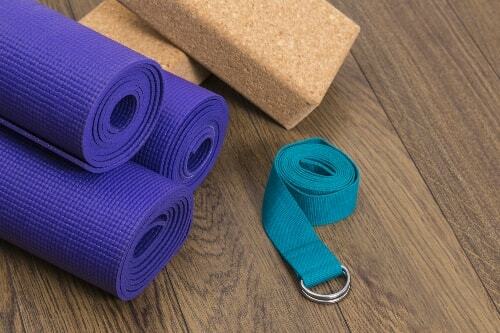 What Should You Bring To Your First Yoga Class? The types of yoga mats are endless and range from extremely cheap to super pricey. I just recommend looking around and seeing which one you feel the most comfortable on. The first yoga mat I started out with was from Jade Yoga. It is a higher end mat, but I felt it was completely worth it. I was having a hard time staying in poses at the time because my hands kept slipping when I sweat, and this one is non slip. I had this yoga mat for three years (it lasts a long time!) until I recently decided to try out the yoga mat from Aurorae Synergy, which is specifically designed for hot yoga, bikram yoga, or people that tend to sweat more. I decided to try it because the cheap yoga towel I had been using since I started hot yoga just wasn’t giving me as much grip as I was hoping for. I must say, after trying out the Aurorae Synergy 2-in-1 mat, I’m never going back. It provides the perfect amount of grip and allows me to hold my poses much longer! You especially need this if you are going to a hot yoga or bikram class. Hydrating before is important as well to prevent dehydration from the extreme fluid loss from sweating. This is more essential if you are going to a yoga class where you are going to sweat a lot, like bikram or hot yoga, obut if you just naturally sweat a lot I would bring one to a non-hot yoga class just in case. You can either use a regular house towel, or you can buy a yoga towel. Regular towels are usually shorter than the actual mat, and don’t stick nearly as well as yoga towels. Every yoga studio you go to will have blocks, straps, and depending on the studio, bolsters and blankets. Definitely grab a pair of blocks the first time around to see if you need them. Most likely you will because you will be tight. I used a blanket starting out as well to sit on. They are very helpful when you are doing seated poses to help maintain an upright posture! I hope this article has given you the information and power to begin your own practice. If there is ONE thing you could take from this article, I want it to be that your practice is for YOU and no one else. When you embark on your yoga journey set your intention to improve, grow and learn. If you have an open mind, you will succeed! Please comment below with any questions you have about beginning your yoga practice!